So for todays ride I had a ninety minute zone 2 with a fifteen minute zone four interval. My legs were feeling pretty anxious to go all day and when I saw that the weather had cleared up from the storm this morning I was practically giddy to get out in that sun. Right from the get go I knew this was going to be a hard one because the wind was blowing hard from the south today. Once I hit Raytown Road I launched it and I found a position I really like. I can now put my hands center of my bars, right in front of my face as I tuck down to hide from the wind, getting super low and aero while at the same time I had a ton of power from that position. I averaged about thirty two miles an hour for the first ten minutes and then I hit a climb and then at the top was a false flat. Bottom line is that I felt super strong and I now have a new TT position on the bike that I fancy. 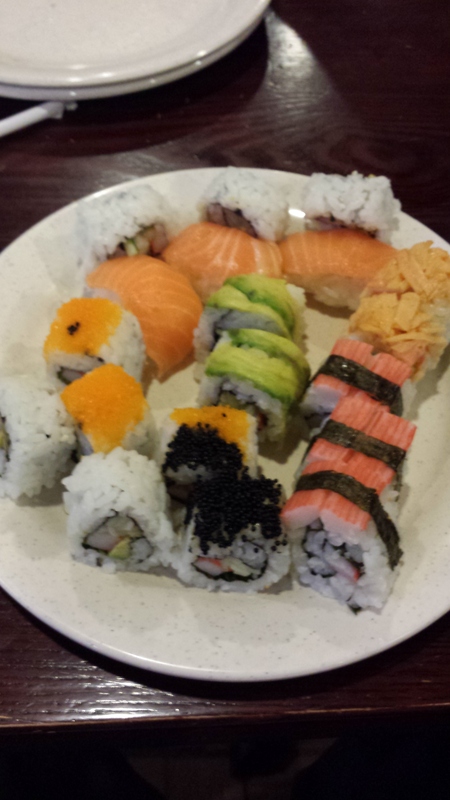 Once I finished up my ride, I headed out for some good sushi! I love sushi so much, its almost a curse, I can’t stop eating it. I have always loved fish and I really like rice so put the two together and baam dish well served for me.